Here at Camuso CPA, we offer a wide array of tax services for cryptocurrency investors and traders including tax preparation, tax planning and portfolio reconciliations. 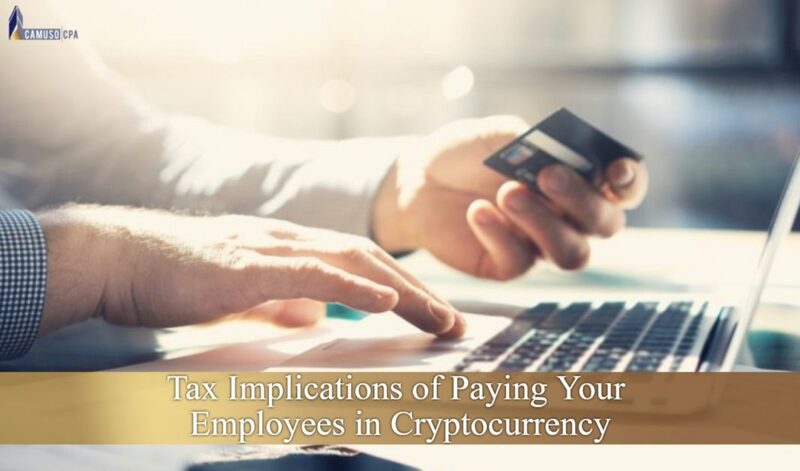 If you’re thinking about paying your employees in a cryptocurrency such as Bitcoin or if you are an employee interested in receiving it as a portion of your pay, there are a few tax implications you need to consider before doing so. The IRS treats cryptocurrencies as property. Simply holding cryptocurrency, whether it has gained value or lost value, does not mean that you owe taxes. In order to owe taxes, you would have to sell cryptocurrency, trade for another cryptocurrency, or purchase something with it. These are known as taxable events. This means that if a business uses cryptocurrency as a payment method for employees that there are multiple tax implications. Based on the company’s holding period and cost basis they will be exposed to capital gains liabilities when they use their assets to pay employees. They will still be able to report the employee’s payment as a business expense which is beneficial for taxes. A taxpayer who receives digital currency as payment for goods or services must, in computing gross income, include the fair market value of the virtual currency, measured in U.S. dollars, as of the date that the virtual currency was received. If a virtual currency is listed on an exchange and the exchange rate is established by market supply and demand, the fair market value of the virtual currency is determined by converting the virtual currency into U.S. dollars (or into another real currency which in turn can be converted into U.S. dollars) at the exchange rate, in a reasonable manner that is consistently applied. According to the IRS, all payments paid to employees are subject to income withholding requirements regardless of what form of payment the business uses to pay the wage. Therefore, the fair market value of an employee’s cryptocurrency earnings must be included on that employee’s W-2 form, and these wages will also be subject to federal income tax withholding, Federal Unemployment Tax Act, and Federal Insurance Contributions Act requirements that apply to property-backed payments. Business owners who are exploring using cryptocurrencies to pay independent contractors and carry out business-to-business payments aren’t immune to information reporting requirements just because they’re using virtual currencies. So if a company pays rent, salaries, annuities or other compensation using cryptocurrency transactions that are valued at $600 or more—and the recipient is not considered a tax-free entity—the company is required to report the fair market value of each transaction at the time of payment both to the IRS and to the recipient. If you’re also making payments to independent contractors for services rendered, you would also need to be reported payments valued at over $600 on the contractor’s Form 1099-MISC. Failure to do could result in hefty fines for your business.